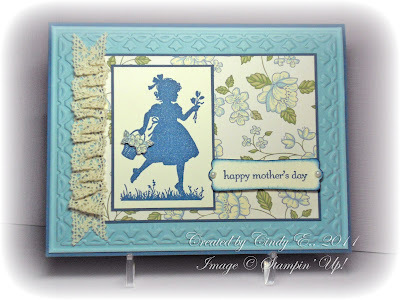 Note the flowers, cut from Springtime Vintage DSP, cover the Easter Eggs in her basket, so it becomes a Spring or Mother's Day card, not an Easter card! Beautiful! Love the colors-even though purple is my favorite color! Beautiful card!! I just love the colors too!! Such a beautiful, lacy, frilly, perfect little girl card! Ah, very clever with the cut out flowers! Stunning card. You always make them look so perfect! So pretty! Love the ribbon treatment and the color combo. March Swaps and a Sneak Peek!